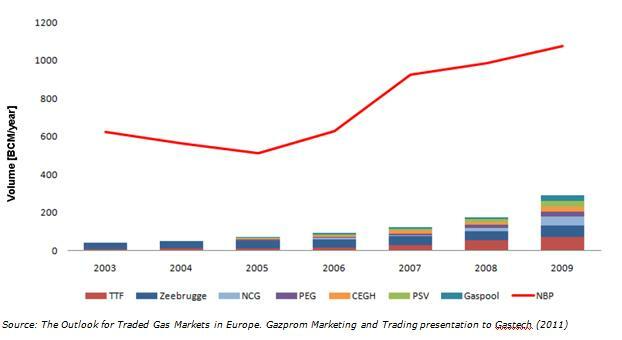 In the last few years there has been an explosion in the number of natural gas futures contracts listed across the European energy exchanges. Traditionally the European Gas market has been heavily focused on screen based brokered OTC trading, with only ICE (formally IPE) UK NBP futures having a long established presence in trading portfolios. Even at the NBP, futures have historically make up a fraction of the overall traded volume. The explosion of products may signal a significant milestone in the development of the Continental European hubs. This mirrors the general increase in regional hub liquidity and move away from oil indexed pricing. 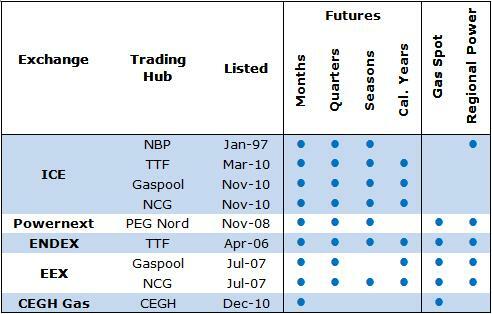 In the last few years there has been an explosion in the number of natural gas futures contracts listed across the European energy exchanges as set out in Table 1. Traditionally the European Gas market has been heavily focused on screen based brokered OTC trading, with only ICE (formally IPE) UK NBP futures having a long established presence in trading portfolios. Even at the NBP, futures have historically made up only a fraction of the overall traded volume. Increased levels of sophistication of participants, particularly around credit risk and cashflow management. The development of cleared OTC products further supports an increased focus on counterparty credit. Opportunity to challenge transaction costs through the development of alternative markets. At the same time, exchanges are looking to promote liquidity by expanding their product offering. For example there is a relatively low incremental cost of ICE adding Gaspool, NCG and TTF contracts to its existing NBP offerings. Regardless of the drivers of the increase in products it is likely there will be casualties. It is hard to believe that the market can support more than one set of products for hubs that still have limited liquidity. Moreover, given the physical interconnection and associated high levels of price correlation it is questionable whether there is a need for futures contracts at all of the traded hubs. A parallel can be drawn with the rationalisation of the UK spot power exchanges that emerged after the introduction of the new trading arrangements in 2001. Aside from the market drivers, market participants (most of who are active across all exchanges) would certainly benefit from rationalisation through reduced internal organisational complexity and costs associated with being active across all markets. So where will the liquidity go? This could be driven by the product offerings of each exchange. There are two flavours of one stop shop concept: ICE has the advantage of offering a broader product offering across the energy spectrum. Whereas the Continental geographically focused exchanges have the advantage of offering the underlying gas spot market, simplifying the transition between trading and balancing. However, these factors are likely to be of secondary importance as ultimately the success of each contract will be driven by the liquidity of the underlying hub. Despite significant year on year increases in trading activity at the Continental Hubs the total traded volume across all these hubs remains a fraction of those at the NBP. A longer term development may be a rationalisation of the underlying traded hubs and the introduction of basis contracts to the less liquid hubs or physical locations to meet risk management requirements.